HopeNYC is heading out to Baisely Pond park on Sunday June 10th to have FAMILY DAY: AVENGERS EDITION! Ever had a picnic or sports day with your family? Imagine that but larger with over 400 people! There will be tons of games for ALL AGES! Running races, Go cart racing, volleyball, cricket, dodgeball, 🎲 and so much more team games! Can’t walk? There will be table games like checkers and cards that will also be worth points! If you look out in the park for HopeNYC on Family Day, it will surely be the large, loud, colorful crowd of people! It’s not too late! You can visit HopeNYC for service on June 10th at 10:30am! Right after everyone will go to the park. You can be assigned to one of the 4 teams: Iron Man, Spider-Man, Black Panther or Thor. A Few 50s Facts To Know Before Saturday’s Sock Hop! Have you heard about the Sock Hop? Get your swing on This Saturday at HopeNYC starting at 6pm! There will be competitions, prizes, food and dancing the entire evening! Proceeds goes towards praise and worship garments for the dance ministry. What is a Sock Hop? A Sock Hop was a dance event held for teenagers where they danced in their socks to avoid scratching the wooden gym floor with their shoes. dancing every Sunday and creating an atmosphere of worship at the front of the altar during service. Photos and info found on Pinterest and google! Find HopeNYC service times, directions, and info from http://www.HopeNYC.com! What Makes This Easter Different? Grab a coffee from Compass! Make your way upstairs and have your seat! Show control is taking over this Easter Sunday at HopeNYC! Before you panic! The show is done as a great expression of worship! This production was carefully planned and put together to express the wonderful person of Jesus and show what He has done for the world! It’s going to be a broadway style production! Spectacular lights, sounds, live dancing, great music and more! You don’t want to miss this Easter Experience about the Crown, Cross and, Nails! Oh it will be different! 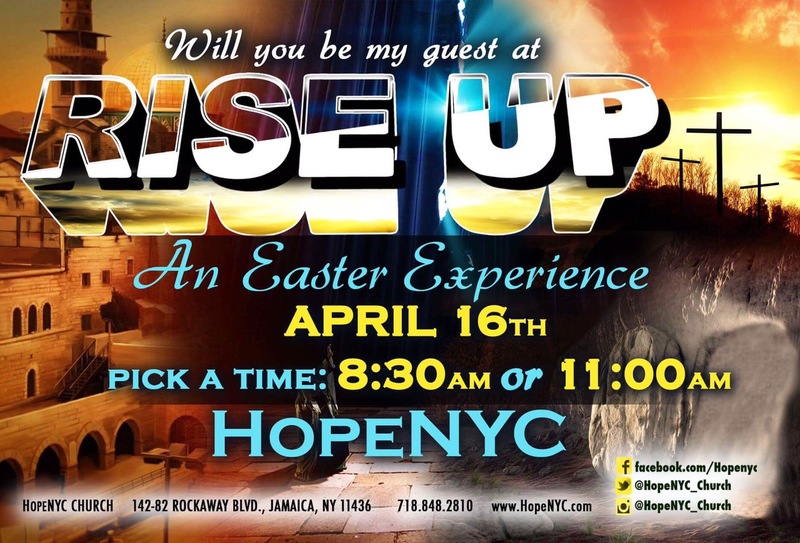 HopeNYC has two amazing events leading up to Easter service! Check out my two previous blog posts for more info on these! Only The Cool Kids Will Be There This Saturday! Imagine! The crowd cheering you on! You go home with sweet victory holding a basketful of candy you can chomp on for weeks! You spend an unforgettable sunny Saturday in the park with your friends and family! Those are what the kids are going to experience! HopeNYC’s 10th Annual Easter Egg Hunt is happening this Saturday at 10am SHARP! It will be held at Baisely Pond Park and it’s just for ages 1-9 years old! Parents! Bring them to the park on time for registration! FREE ADMISSION & PRIZES! There will be 20,000 candy-filled eggs! The child that finds the gold egg will win a bike! The child that finds the silver egg will win a scooter! There are prizes! Also the sure excitement of taking home dozens of candy-filled eggs! So many has been blessed over the years! We can’t wait to see this year’s winners! School is not the only thing this week on the minds of the kids at HopeNYC. They have been busy helping victims of human trafficking! Creating over 60 candy-filled boxes! Taking charge of a breakfast menu! Supporting the ministry! Prepping for a 2018 launch event! learn, pray, grow and play but also take care of their ministries. HopeKidz and Tweens help kids grow in Christ all year round in the most exciting creative ways. They’re constantly aiming to make each year better than the last. They also make new kids feel welcomed and at times make it their mission to help others across the globe. Sending over some shoes & toiletries over the past summers. This week, Hope Kidz created love boxes just in time for Valentine’s Day! They were brightly colored, beautifully wrapped and filled with chocolate! Hope Kidz provided the perfect presents for your loved ones and supported their ministry financially! The Tweens ministry is exclusively for kids ages 10-12. They meet every Friday at 6pm for fellowship, worship, games, prizes, food & The Word! They also plan trips & have fun video contests! They are launching with their first meeting tomorrow at 6pm! After a fantastic service they are serving up breakfast on Sunday at Compass: Ham and cheese sliders with tater tots! They successfully sold tickets over the week and all proceeds are going towards rescuing victims of human trafficking and providing clean drinking water to impoverished countries. I’m just typing in amazement! Being a weekly attendee at HopeNYC, I see their enthusiasm, faith and passion in what they do! This has been a busy week but they’re going accomplish a lot this year! Have your biggest Thanksgiving celebration this year! Looking to have a more grand Thanksgiving this year? Here are some keys to maximize your holiday experience! First off you would need to eat more, extend your family and of course, be thankful! This can get done in just one week! Here’s how! Make room for the Thanksgiving Tower! This is 10 times more than your typical Thanksgiving dessert! With this tower, you will get to enjoy your favorite classic: pumpkin pie….along an unbelievable variety the best desserts ever created! Check out this video! You will get brownies, cheesecake, cake pops, bread pudding, macaroons and much more! Plus this is shareable for friends, families, co-workers and groups! It’s going to be hard to make room for dessert this year! Proceeds from this Compass Café Purchase will go to providing clean water and rescuing victims of human trafficking! Come spent time with the Hope family! They will love you and make you feel welcome as soon as you step inside! Church is the perfect place to be thankful and express that gratitude to God. The one who gave us everything we have. After service, come enjoy HopeNYC’s Thanksgiving feast! There will be plenty of food and friends which makes it a great pre-celebration to the big day! Text a friend or get a fancy card from dollar tree wishing them a Happy Thanksgiving! Maybe a new friend you met on Big Sunday. It’s also fun to share your experience by taking photos of your thanksgiving tower and your day! After this is all over, be on the lookout for HopeNYC’s Christmas Parade on Rockaway Blvd! This will be on Sunday December 3rd at 5pm! A great way to kick off your Christmas celebration! Don’t Bring Gifts To This Birthday Party! This weekend, you are invited to one of the greatest birthday celebrations in New York! This Sunday is not going to be ordinary. Compass Coffee turns two years old and this birthday has been incredibly and carefully planned. Compass is a Missions coffee shop that was created to help people in other countries get clean drinking water and rescue girls out of human trafficking through its partnership with The Zion project! We will hear from the actual founder of the Zion Project: Pastor Deven Wallace. We will see her live and she will be preaching THIS Sunday at 10:30am at HopeNYC. Right after service, Compass will actually be giving you presents 🎁 as we celebrate this birthday! There will ALSO be special surprises for people who purchase a cup of coffee, dessert or item that day! A Jodi Bakes pumpkin Pie is one of the best you will ever try! How many layers do you need for your dinner party this year? Beautifully frosted fall cake made by Jodi Bakes! The perfect blend of coffee and a splendid stirring of pumpkin and just the right amount of sweet cinnamon goodness! Such an extraordinary high-quality sip! This is the Pumpkin Spice Latte at Compass! Fall macaroons at Compass! These were a hit last year! Dinner, dancing, entertainment and more! A night fit for a queen: YOUR MOM! Everyone is invited to this dance! It’s THIS SUNDAY April 30th at 3:30pm! It’s formal attire, there’s free gifts for all moms, great door prizes, comedy, delicious food and deserts and childcare will be available! There’s also a prize for the best gentleman of the night and more! Although this night is devoted towards giving the mothers the royal treatment, EVERYONE IS INVITED TO THIS EVENT! PLUS Minister Eddie Neblett and DJ Mark Xclusive will be in the building! Get your tickets TODAY at HopeNYC! The event is also hosted by HopeNYC’s International Missions Ministry! Feel free to check out their Facebook page by clicking below and let know if you’re interested in attending or have any questions! What are you doing next week? One of the most significant days to ever happen just to honor The Savior Jesus, The Word at beginning and one who sacrificed His Life to save the world 🌎 If there are no plans, I encourage you visit HopeNYC for an amazing Good Friday service: NEXT WEEK April 14th 6pm. Visit the HopeNYC website for information, directions, weekly services and additional upcoming events. This Good Friday service will have an amazing Word for you. There’s worship in music, the holy communion, gifts for first time guests and washing of the saints feet (amazing yet optional) The opportunity to do what Jesus did when He washed the foot of His disciple. Just look around, pick someone in the room or a friend. Towels and buckets will be provided. Bright and early on Saturday morning! 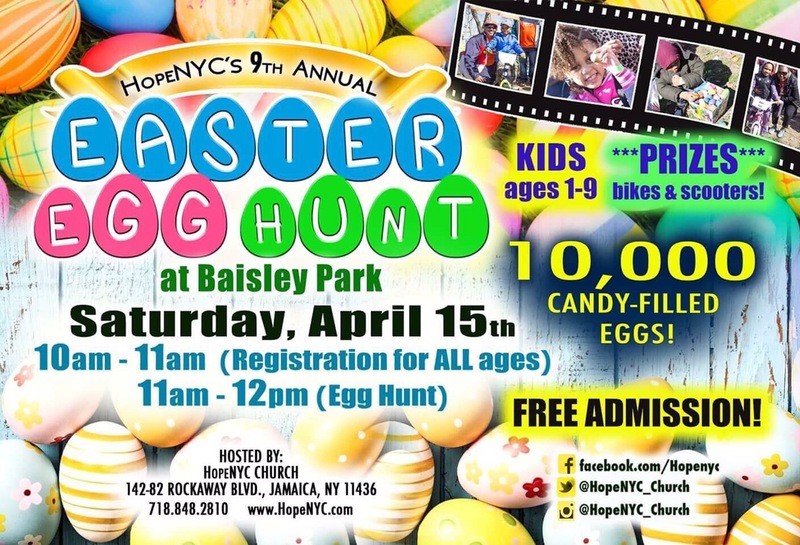 It’s time to have fun at HopeNYC’s 9th annual Easter egg hunt! Everyone’s invited to spend a sunny morning with us at Baisely park while kids ages 1-9 explore with their easter baskets hunting around 10,000 colored candy-filled eggs. Finding a gold or silver egg gives them an amazing opportunity to win a bicycle or scooter along with some other fantastic prizes. Going home with dozens of eggs filled with candy is good enough for me 😀 The best part is, Admission is free! The Priest, Pilate’s wife, and Peter! What went on in their minds after witnessing the most horrific mind-blowing scene in all humanity. Come see their view of the situation in a production where the story begins right at the start of service at 8am. Too early for you? Catch the 11am service! This broadway style yet Holy Spirit annointed production is filled with a life-changing message, dance, and an atmosphere that will take you back to the past where it all happened. If you are in New York make your way to Rockaway blvd for an exciting Easter service.